Want to make the best banana bread you’ve ever eaten…without eggs or dairy! Well here it is on About.com. No need to mess with this recipe. The only modification that I sometimes make is to add another banana depending on how large and ripe the ones that I have handy are. And I make this in a brownie square pan. Love it. I use Canola oil in the recipe and to grease the pan. I also use a potato masher to mash the bananas. Since my child adores Curious George, and he adores this banana cake recipe even more, I have made this banana cake in the shape of a monkey (you can buy the mold from Wilton’s online). 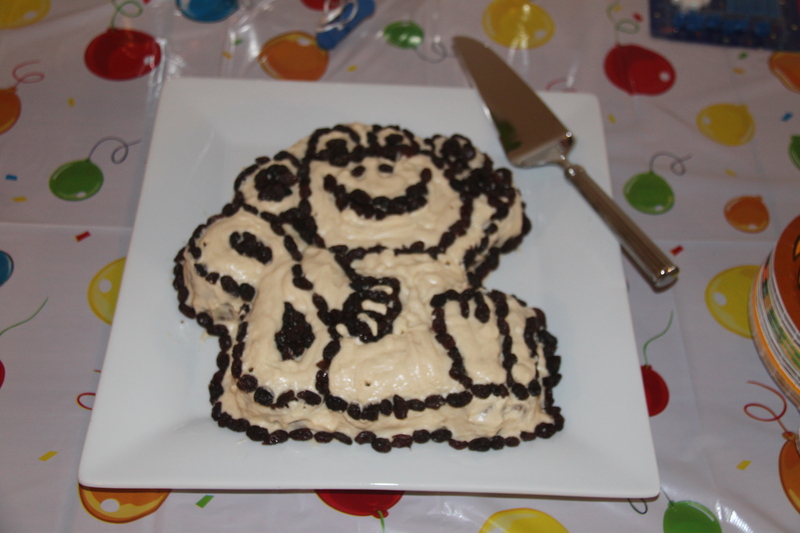 For his two-year old birthday party, instead of chocolate frosting, which is not recommended for preserving furniture or the sanity of the parents of his friends, I decided to frost this monkey with vanilla frosting from Food.com, decorated with raisins. What two-year old (and his parents) doesn’t love raisins!